Screens, screens, screens - Samsung has a one track mind so far this week. Samsung Display announced Monday the company will unveil a pair of new screen technologies during Display Week 2013 at the Vancouver Convention Centre, which runs through May 23. The Korean manufacturer has chosen the annual Society for Information Display industry event to highlight its latest Diamond Pixel LCD technology on screens big and small. On the larger end of the spectrum is an 85-inch Ultra HD LCD TV panel with a screen resolution of 3840 x 2160 featuring local-dimming control, which consumes 30 percent less energy than traditional LED displays while retaining vivid color reproduction. Keeping up with the amped pixel theme, Samsung is also showing off a 10.1-inch WQXGA (2560 x 1600) LCD for tablets and a 13.3-inch LCD for notebooks. The company claims both can deliver 30 percent greater power-savings than existing LCD tablet screens, though we'll believe that when we see it. For phones, Samsung Display is demonstrating a 4.99-inch, full HD (1920 x 1080) AMOLED display, which the manufacturer claimed has the broadest color gamut to date. Since the human retina reacts more to the color green over red or blue, Samsung's Diamond Pixel packs more green pixels into a display panel, resulting in a sharper screen that accurately reproduces roughly 94 percent of the Adobe RGB color space. As a result, Samsung Display said text messages will appear 2.2 times clearer than 1280 x 720 HD displays, holding up against magnification of up to three times with fewer jaggies than conventional LCD screens. 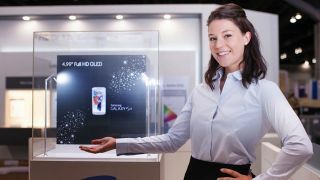 Samsung has yet to confirm when Diamond Pixel technology will begin shipping, but Display Week attendees can check out the tech - plus a prototype 23-inch multi-touch LCD display capable of picking up 10 touch points simultaneously - through Thursday. Read more about Galaxy S4 updates that could soon make it to the Galaxy S3.